Any of you who have owned pets in your life might find yourself talking to them at many points during the day as if they understand you, we all do it, a lot of us sometimes even vent to our pets because although they don’t understand you, they will always be around to hear whatever is bothering you as long as you have a tin of food in your hand. That being said, I can safely say from personal experience that I have never gotten advice on what to do from one of my three dogs, should I murder someone. That’s just what The Voices explores, a dark comedy/horror film that evokes the spirit of John Waters with the disturbing absurdity it produces. My kind of film. Ryan Reynolds stars as Jerry, a man who has a rather upbeat and Technicolor view on the world, which is expressed solidly through the cinematography. He seems like the typical shy guy you meet who just needs to come out of his shell. However, things are a little more…complicated than that. Jerry is severely mentally ill, we see him at a therapy session within the first moments of the film, and he admits that he has stopped taking his prescribed anti-psychotic medication for some time now. His Technicolor world is a result of not taking this medication and within it he has hallucinations of his dog, Bosco, and his cat, Mr. Whiskers talking to him in a very odd angel/devil on the shoulder scenario. Bosco represents Jerry’s good morality whereas Mr. Whiskers taunts Jerry into becoming a serial killer and giving into his darker impulses, naturally with a Scottish accent. After an accident one night, Jerry ends up killing one of his co-workers and after some persuasion from his cat, he cuts up the body and proceeds to put the head in his refrigerator, right next to the eggs and milk. Of course, in typical film fashion, this begins to snowball and we’re left with a disturbingly hilarious story arc as the body count begins to pile up and the missing persons begin to becoming more noticeable. That being said, the film does tackle some serious mental health awareness issues and becomes quite tragic in a sense as Jerry begins to struggle with his own inner demons and tries to convince himself that he’s a good person, despite each aspect of his psyche trying to persuade him back and forth between morally correct and psychopath. Ryan Reynolds is superb in this role; he has always been one of my favourite contemporary actors, not convinced? Go watch The Nines or Buried and it’ll change your mind, he has a truly impressive acting range when provided with some worthwhile material and he possesses perfect comedic timing which is expressed thoroughly here. Norman Bates seems to have been a clear direction he was heading for, which is successfully achieved, boyishly charming yet with a clear sadistic side. 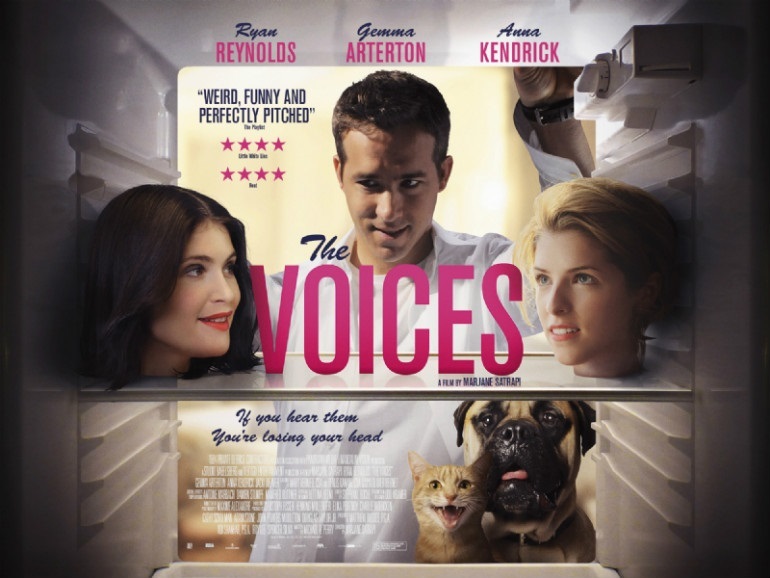 However, what is particularly interesting is that Ryan Reynolds doesn’t just play one character in The Voices, he plays three (four counting another very short voiceover role). The voices of Bosco and Mr. Whiskers are played by Reynolds with accompanying accents, a rather Southern sounding twang for the morally good Bosco and the aforementioned Scottish accent for the evil Mr. Whiskers, which as a Scotsman, I found to be perfectly fitting. Although it’s clear as the film goes on that Reynolds is doing the voice over for these characters, you will be debating with yourself for the first initial moments because of how surreal it is to hear the same person playing three separate people in such short bursts within the same scene. Reynolds is not without great co-stars though, joined by Gemma Arterton as the main love interest, Fiona for the beginning of the film before spending the rest of her screen-time as a decapitated head and in numerous Tupperware boxes. Anna Kendrick plays Lisa, who becomes the focus of Jerry’s attention as soon as Fiona is out of the picture and Jacki Weaver plays Dr. Warren, Jerry’s psychologist and motherly figure in the few scenes she appears. Each co-cast member plays their roles solidly and within tone to the film when necessary, playing both comedic and fearful when required of them. Helming the film is Marjane Strapi who provides very impressing directing skills, spectacular even. The decision to show us both sides of Jerry’s reality, the colourful world he experiences when he doesn’t take his medication and the dank, sorrowful reality of real life when he’s on them is something that truly makes you sympathise with the character, still jabbing with dark comedy but evoking genuine emotion from the audience. The inclusion of graphic violence is also a strong directorial choice, it’s significantly more brutal and realistic than that of a typical horror film to the point where the colour contrasts of the violence compliment the vivid ‘voices world’ colours. Just everything about the film is balanced very impressively, very John Waters and Tim Burton. As stated before, the film is within a world of its own, extremely fascinating at times, we can sympathise with Jerry when he doesn’t take his medication because it’s then we escape the gloomy, depressing reality of what we know to be our world and escape into a much more vivid one filled with unpredictability and constant entertainment with each new aspect it pulls out from under us. Wouldn’t we all choose that kind of world if we could? Except without the psychopathic tendencies, of course. The Voices is a very enjoyable experience and one that I believe I will visit a few more times in order to experience the surrealism and memorable trio of main characters. The cast and crew are a very important foundation for any film and they successfully executed what they aimed to achieve in this case through strong casting, acting and directing. Most importantly, if you have a dark sense of humour, it’s going to be right up your street, the best blend of horror and dark comedy I’ve seen for quite a number of years. Reynolds and Strapi are unforgettable in their roles both in-front and behind the camera, a combo that I hope will team up again for the future. The Voices hits UK cinemas on March 20th and is currently available on VOD.